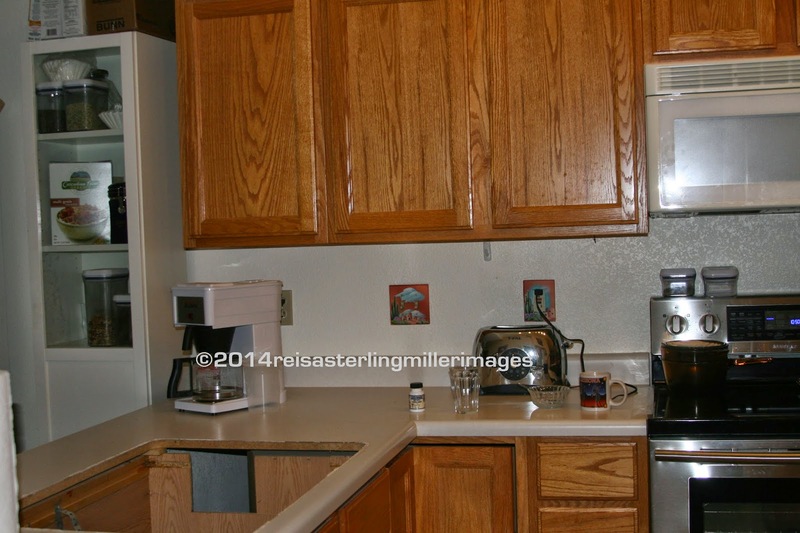 We've lived in our Arizona home for over six years and we've done a few home improvements during that time. 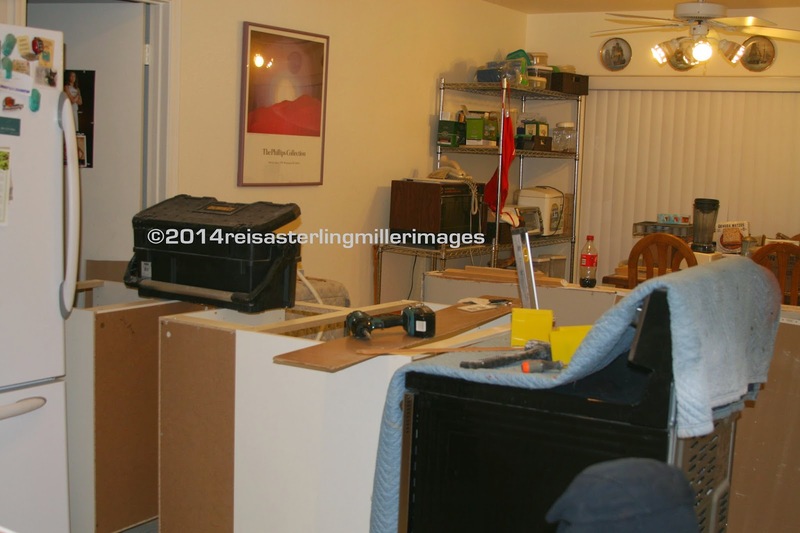 We took out all the carpeting (nice in cold weather climes, awful here) and put in bamboo flooring everywhere. We took out that cursed Bermuda grass in the back yard (hated fiercely by the dogs because it's so hard) and replaced it all with beautiful pavers. We did put in a strip of nice soft turf grass which the doggies appreciate. Ah, but the kitchen..... a builder's special. 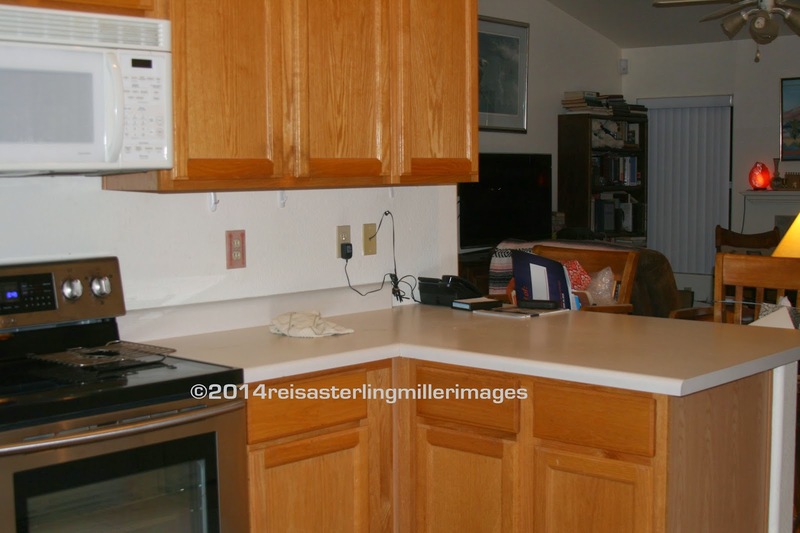 You know that kind.... the least expensive counters, cupboards, etc. Well, the countertops started to chip, here and there. So, there comes a time when talking about it becomes DO SOMETHING! It just so happens that Abbott has a really good friend who has been in the remodeling business for a long time (and is a wonderful musician on the side.) Lou proved to be an enormously gifted craftsman, a perfectionist, very resourceful and an incredibly hard worker. Following his guidance, we went to IKEA and purchased our new kitchen and all that that entails. 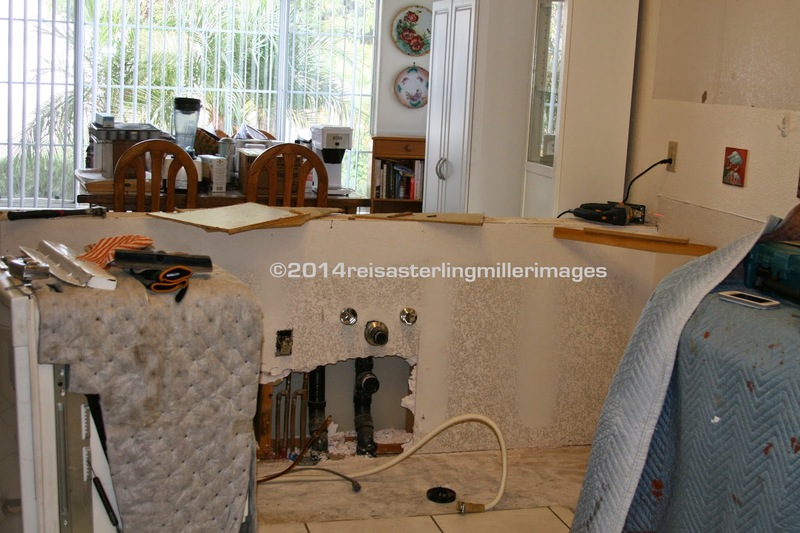 Then the plumber came and pulled out the kitchen sink and the demolition was on! 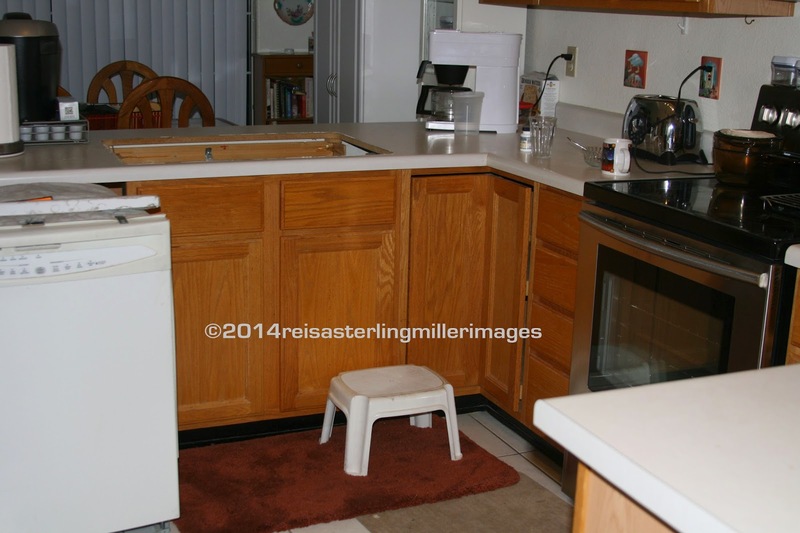 Removing everything from the kitchen proved to be hellish. There was *stuff* everywhere, in the living room, on the dining room table (totally covered) on the kitchen table (totally covered) piled in the guest bedroom, piled on the washer and dryer (that was fun) and spilling out into the garage and the patio. To say it was difficult to walk around is an understatement. We had to eat out a lot because we had nothing to cook on or in. The one thing we managed to keep plugged in was the coffee machine! 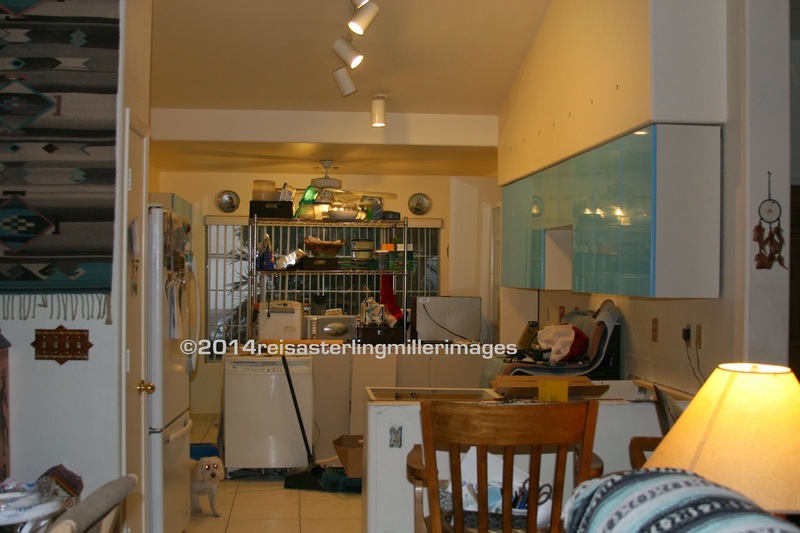 So here are some photos of what we lived through. The end result was.............WORTH IT! 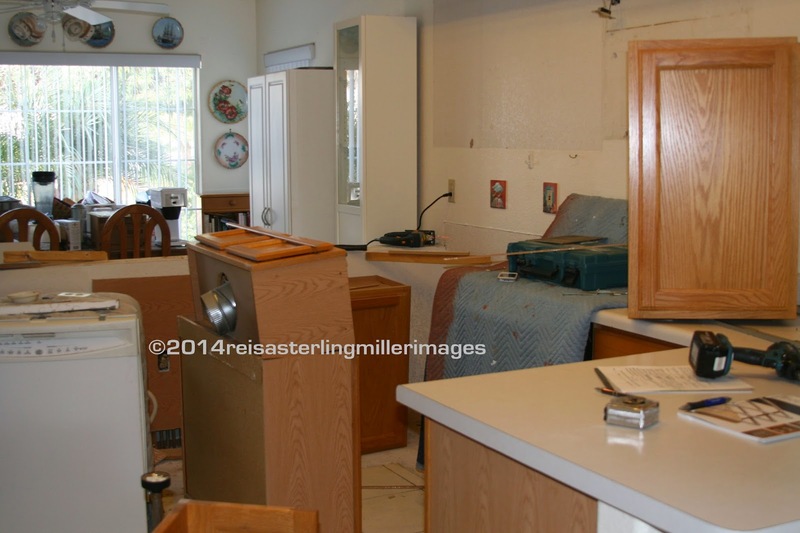 Here's what the kitchen looked like before the demolition. 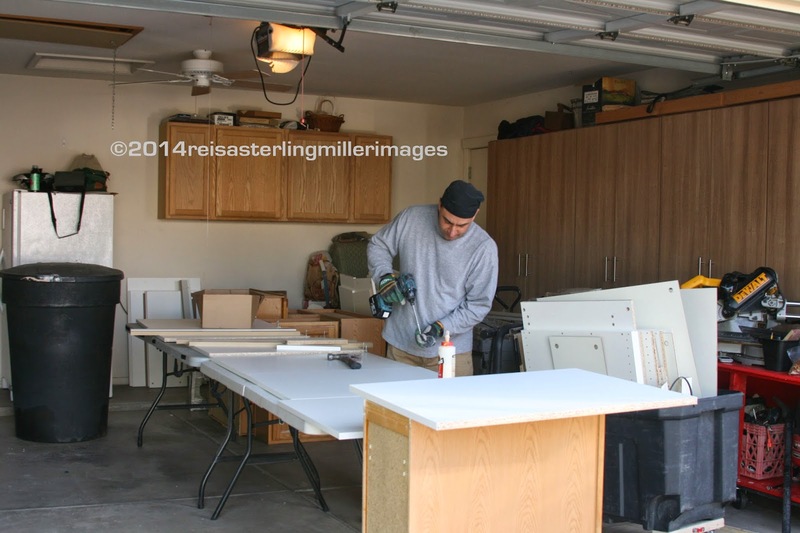 Lou, putting the cabinets together in the garage. The first cabinets go up! 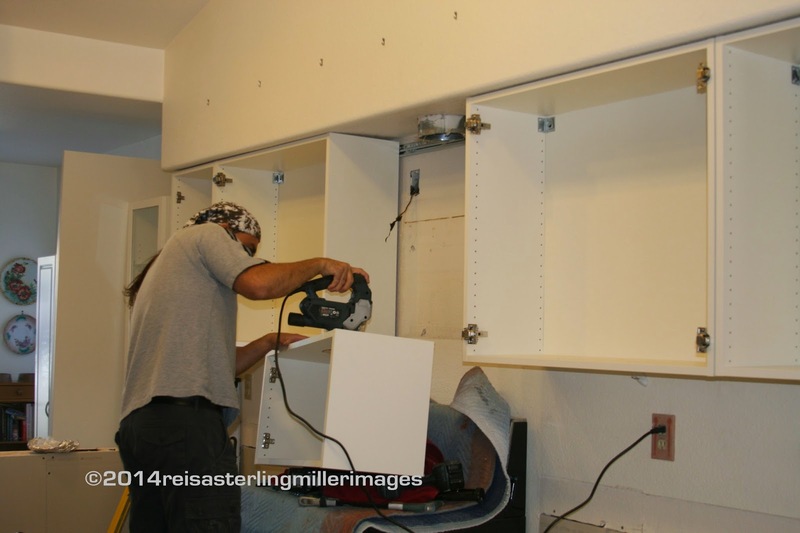 Several of the cabinets are in place. We're waiting for the countertops. A bit of a story here... Lou got a call from a friend he hadn't seen for quite a while, another musician. Guess what he does for his day job now? He works for a local counter fabricating company! 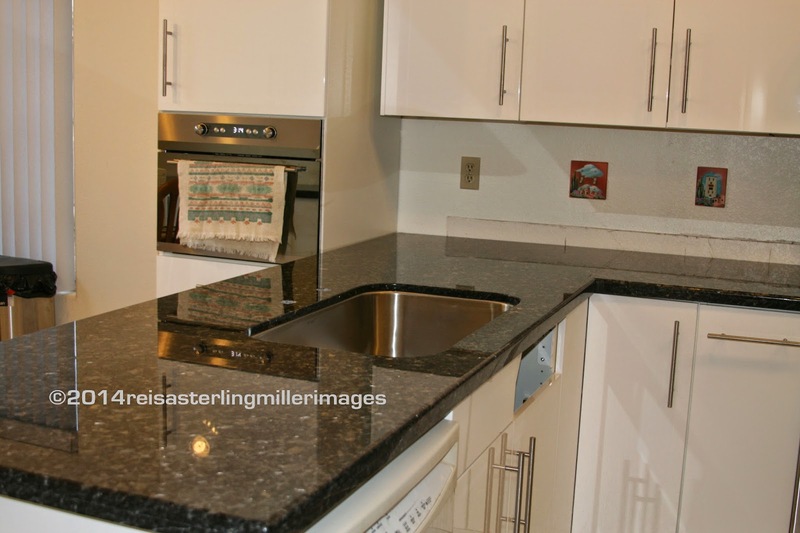 The upshot of this particular good fortune was that we went with his company and you can see the granite installers below. 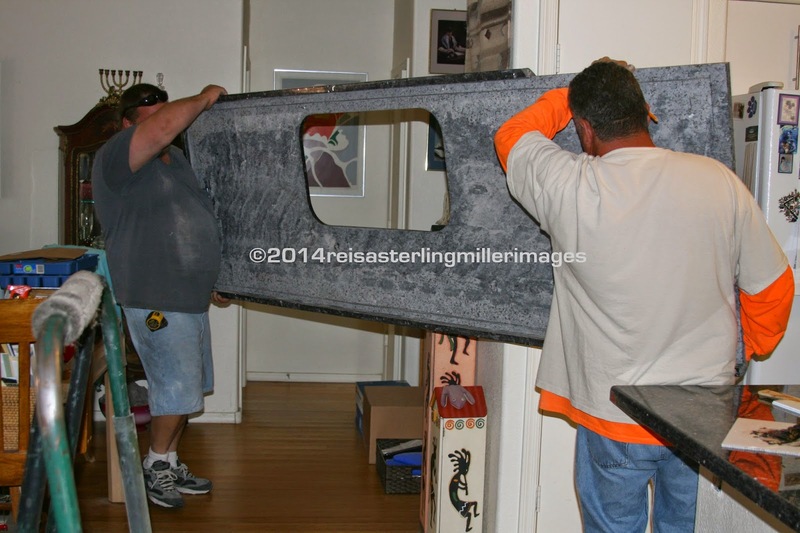 Here comes the really big piece! 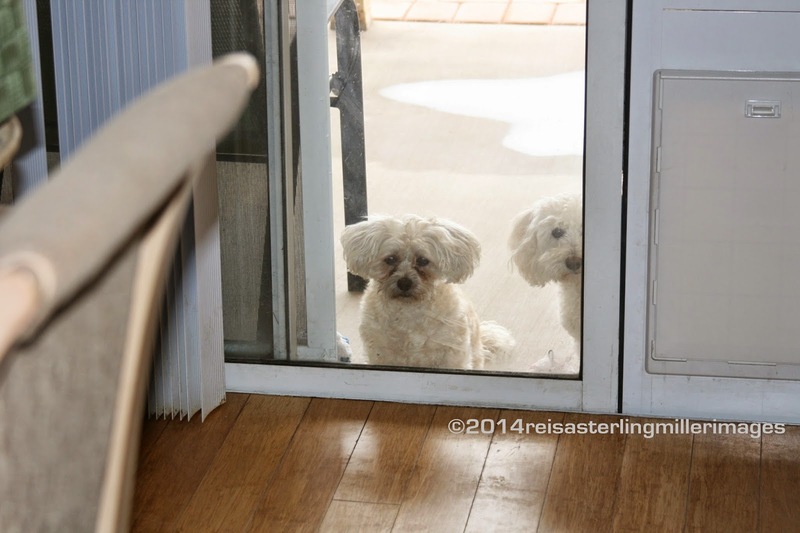 In the meantime, Snuggles and Sterling were banished to the patio while the counters came in! They were not happy. 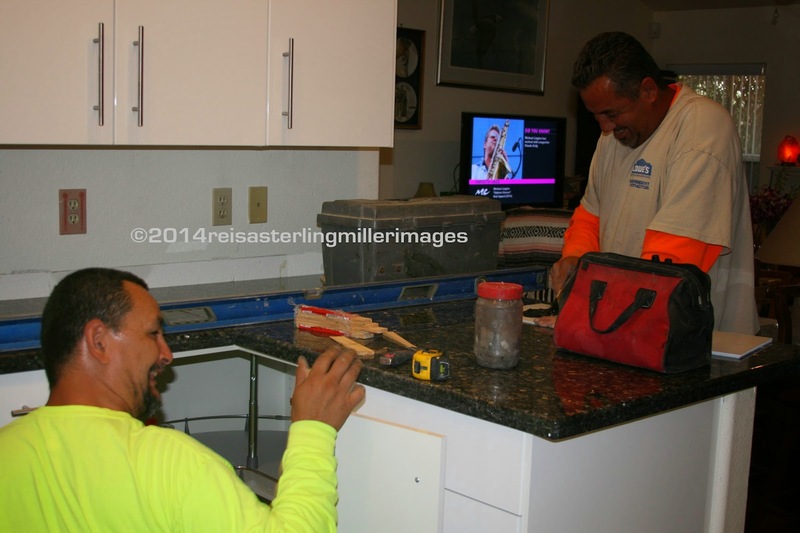 Lou came to make sure the counters were installed to his specifications. The big slab is in as is the new sink! 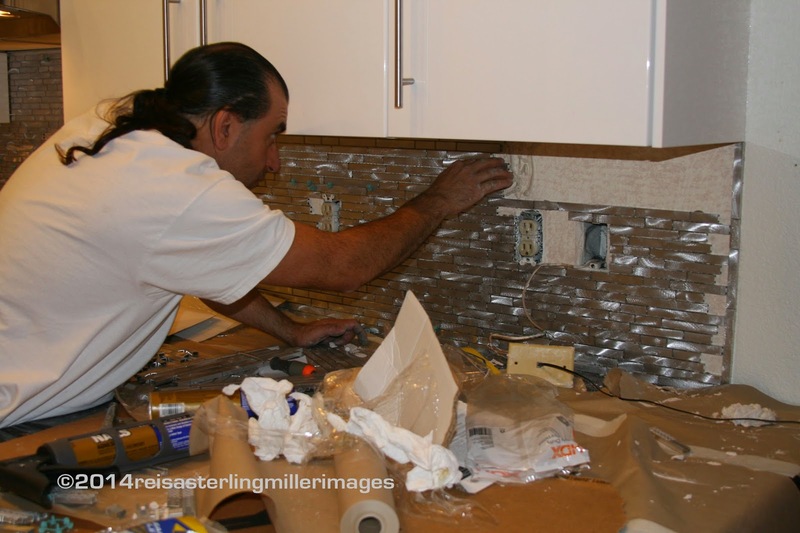 The backsplash is going up by Mr. Perfectionist! 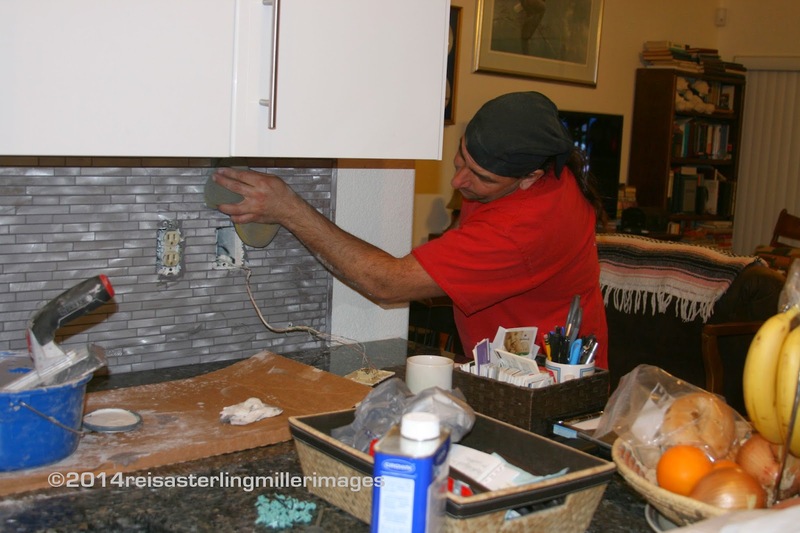 Lou says this was the worst part of the job since the backsplash was made out of aluminum and the ends had to be cut to fit like a puzzle. OY! 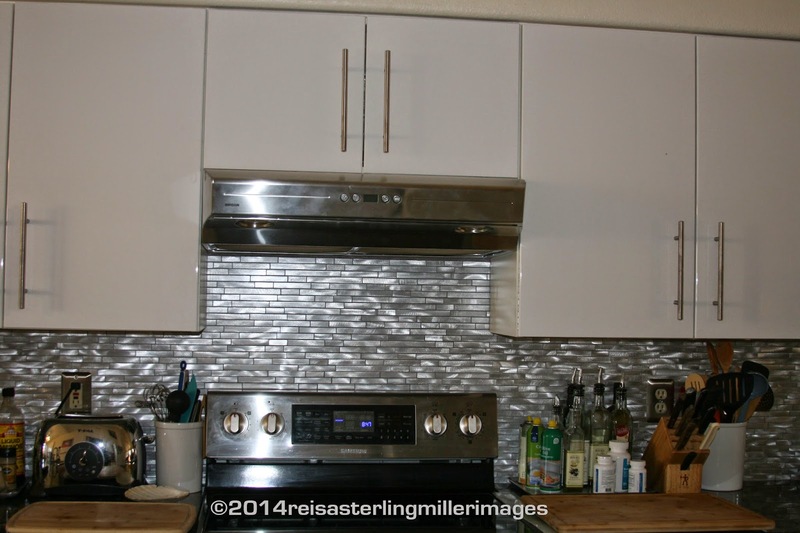 He says he'll never put in another backsplash like this one! I don't blame him.. He had to buy a special blade to cut the pieces. And here's the finished kitchen. 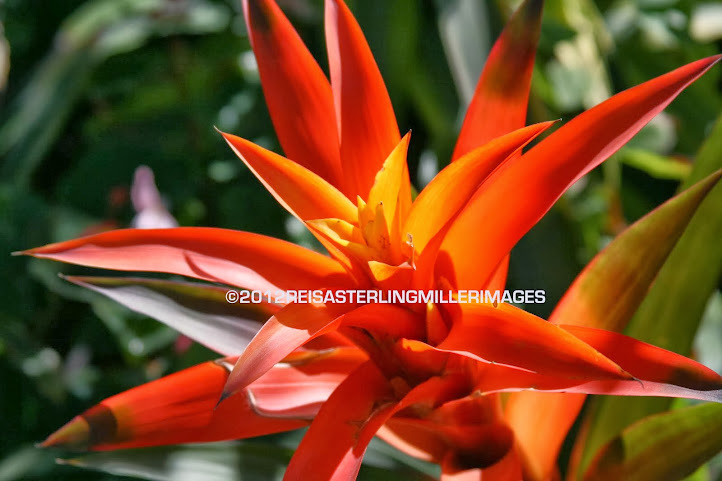 I took 197 photos from start to finish. But these few will give you an idea of what has been going on here from November 18th until yesterday evening. I can't thank Lou enough for the fantastic job he did. If it wasn't for his expertise, his dedication, his wonderful sense of humor, and his easygoing persona, this project wouldn't have gone as well as it did. I offered to adopt him but he just snickered. I'm really glad he and Abbott are such good friends. And this: Thanks, G, for loaning out your husband for so many weeks. It looks gorgeous. Use it in good health! 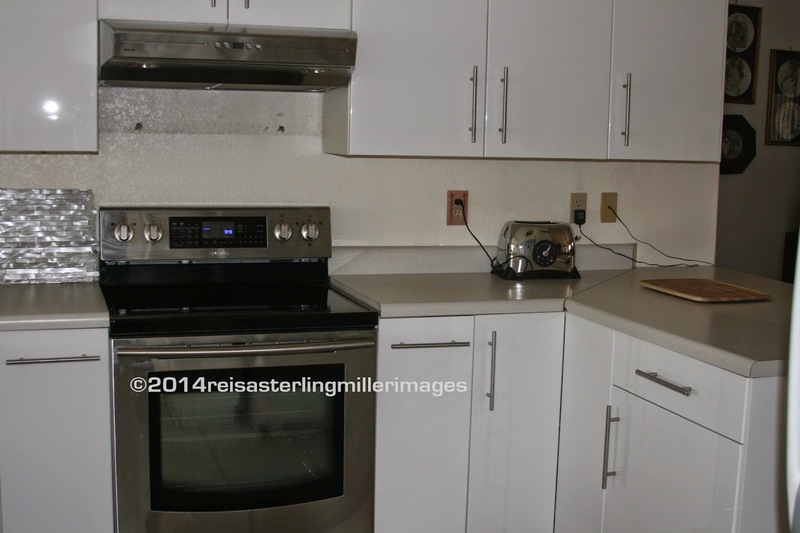 I remember the original Kitchen - can't wait to see the incredible new one! :-) Glad it is complete and you all survived the transformation! See you soon! Tim. It's beautiful. I adore the backsplash. 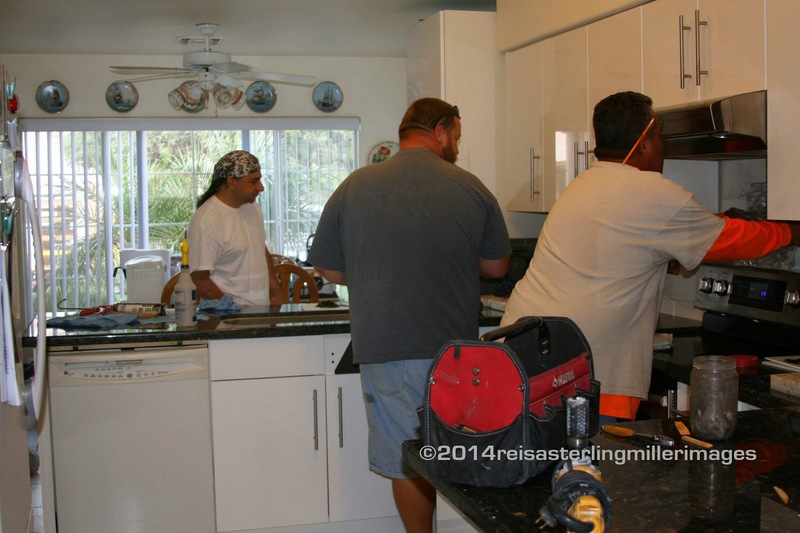 Your new kitchen looks great! 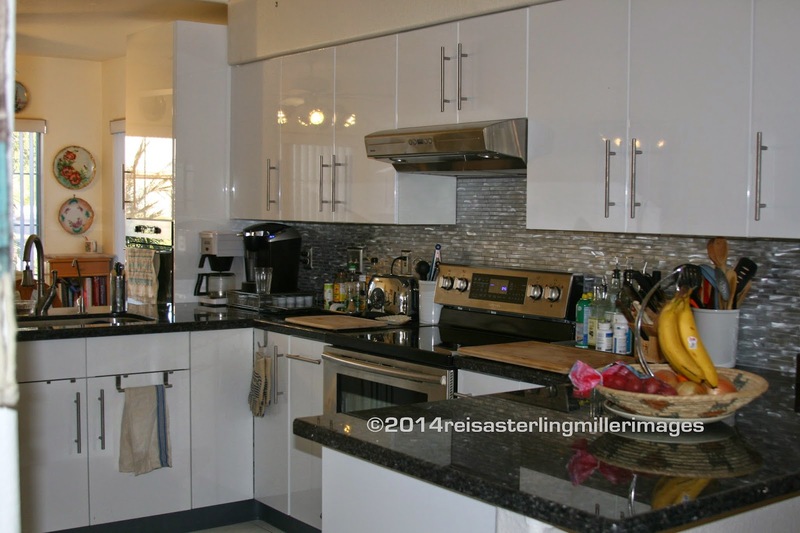 I just love the backsplash and counter tops that you chose!